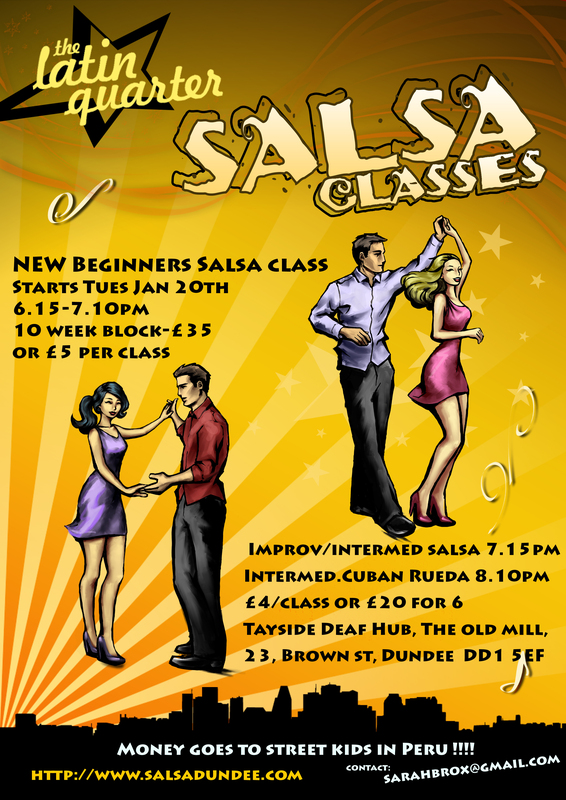 NEW cross body style Salsa beginners classes starting Tues Jan 20th , 6.15-7.10pm, at The Deaf Hub, Old Mill, 23, Brown St, Dundee. 10 week block pass £35, or £5 per class weekly. Class are progressive, no partner necessary, anyone welcome. Can join class first 2 weeks only though. Email sarahbrox@gmail.com for places or more info. Please pass the word. All money raised for Azul Wasi project in Peru. Directions on this site on class page. Please note slight time changes to other classes, I have left a 5 min gap between classes this time to help reduce my timing issues ! Improvers/Intermediate Cross body 7.15-8.05pm, Improv/ Intermediate Cuban Rueda 8.10-9pm. Anyone wishing to join these latter classes must email first to check are at correct level to join class.